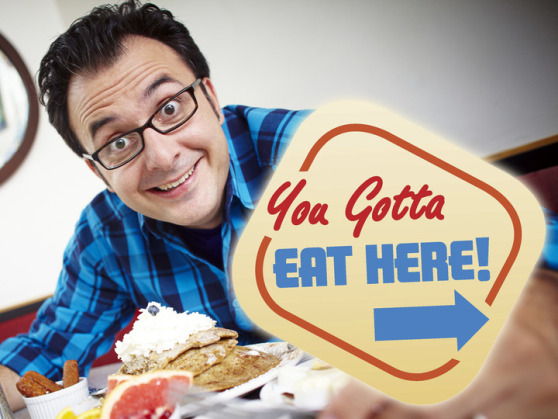 The University of Guelph – You’ve Gotta Eat Here! Did you know our food has been ranked the best on any Canadian university campus for over 10 years? This is because we're constantly sourcing local, sustainable foods for our various dining locations. Today we’re breaking down some of the mouthwatering options available to you both on and off campus. Hospitality Services manages many of our residence dining facilities and other on-campus locations. Check them out below and be sure to visit the Hospitality website for a complete list of dining options! Although all of our food is amazing, Creelman Hall is our most popular on-campus eatery. We call it a marketplace because of its wide variety of shops laid out like an open market. Choose from the all-day salad bar, made to order pizza and pasta, the Mongolian BBQ and so. much. more! Looking for local food or vegetarian options? The 100 Mile Grille features local foods daily and Nature’s Best is always cooking up tasty vegetarian options! Coming soon to Creelman Hall is the Creelman Bake Shop! Follow @HospitalityUofG on Twitter for updates on the Bake Shop’s official opening. Located on the main floor of the University Centre (UC), the food court is the central place on campus to grab a meal, coffee or snack. It offers a great mix of home cooking, vegetarian foods and sandwiches as well as your favourite brands like Subway, Starbucks and Pizza Pizza. There’s something for everyone in the UC Food Court. For those living in the North end of campus, LA is just a few steps away. If you’re living in Lennox/Addington Residence, you don’t even need to leave the building to access their wide food selection! 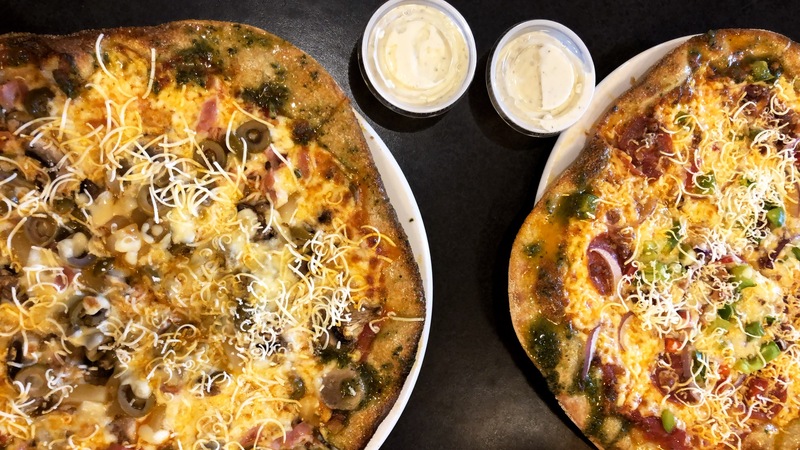 LA features a hot grill, Pizza Pizza counter, a salad bar, a Starbucks and more! The best part is you can take anything you order back to your room to enjoy. Another residence building where you don’t need to leave to find delicious food options! Mountain and Prairie Dining Halls are conveniently located under one roof in our largest student residence hall. 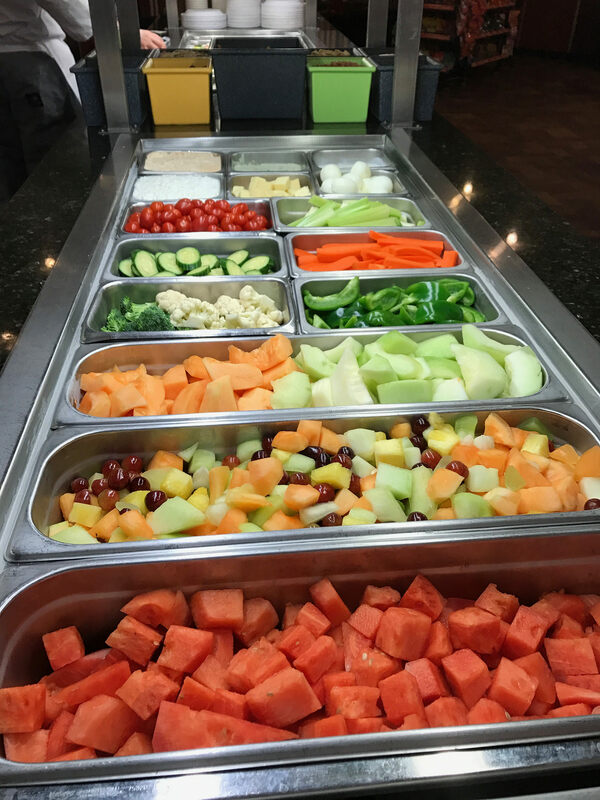 From gourmet waffles, crepes and other desserts in Mountain to the salad bar and hot meals served in Prairie Hall, you’ll never go hungry living in South Residence! Don’t be alarmed when you see food trucks driving around campus Future Gryphons! The Caffeine Canteen serves breakfast and lunch and is a great spot to grab our very own Gryphon Blend Fair Trade coffee. 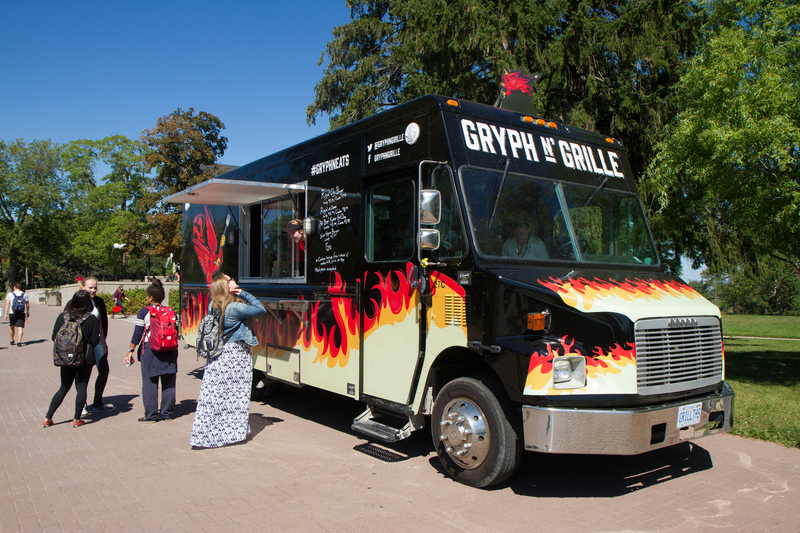 The Gryph N’ Grille serves lunch and dinner and even shows up at special events and sporting events across campus! Be sure to follow them on Twitter to view their daily hours and location. Several food trucks from around Guelph also pop onto campus during the warmer months so look out for them on your walk to class! U of G also offers several dining options that are run separately from Hospitality Services that still deliver the high quality food and service you can expect anywhere on our campus. Bob's Dogs and The Bullring are two places completely unique to the U of G where you can grab some grub! Located in the Brass Taps Pub in the UC, this bakery is dedicated to providing the freshest baked goods available for pick-up or eating in. Many of their baked treats can be prepared to accommodate vegan and gluten-free dietary considerations, so everyone can enjoy them. Bob’s Dogs is a University of Guelph staple. Picture the friendliest man on earth, serving up hot dogs, sausages and veggie dogs year round with a big smile and a side of guitar playing – this is Bob and you NEED to meet him! Run by the Central Student Association, The Bullring is your on-campus living room. Outfitted in the comfiest couches and chairs, it’s definitely the most unique spot on campus to grab a bite, read a book or catch up with friends. Everything on The Bullring menu is full of flavor and made-to-order. They also have some of the most extensive vegan and vegetarian meal options on campus. In addition to delicious foods, The Bullring also hosts an open mic night every Wednesday and can be booked for special events! Did you know you can use your meal plan at off-campus restaurants AND have food delivered to your residence? We’re talking, pizza, burritos, Chinese food, wings, sushi, subs and more! Visit the hospitality website for a complete list of off-campus eateries where U of G meal plans are accepted. Believe it or not Future Gryphons these are just SOME of the incredible on and off-campus eateries at the U of G. Check out our YouTube channel for videos of students trying foods from all over campus. Come tour Canada’s Food University and discover how you could be eating for the next four years of your life! Trust us, you’ve gotta eat here! Coolest thing about your program? I get to do hands-on research with animals! In my Masters, I’ve gotten to conduct my own nutritional trial with rainbow trout, and during my BSc. In Animal Biology at U of G prior to my Masters, I worked directly with horses, pigs, chickens, and cows. I have a love for the U of G school community, the people, and the academic supports. Sharing the knowledge I’ve gained with visiting students is such a pleasure because I know exactly how nerve-racking it can be to find a university to call home for the next 4 years of your life! What is the best thing you’ve experienced while being a tour guide? Or, what is your favourite thing about being a tour guide? The best thing for me about being a tour guide is when families and students tell me how informative and helpful my tour has been. I especially love when I can add personal stories and tips that I think will help students looking into particular programs, clubs, and athletics. Providing a sense of ease and relief in the decision-making process is really rewarding. Pages Coffee House/Tim Hortons in the MacNaughton building is where I love to go grab a coffee and catch up on some homework. It’s central on campus so it’s very close to most lecture halls and the university centre. It’s also a really nice place to hang out with my friends in between classes during the week. Every tour guide goes through extensive training to be able to give you detailed information on so many things U of G has to offer, including residence, academic schedules, personal and academic support services, athletics, and much more. We all love adding personal stories about U of G to our tours as well, and we’re happy to answer any academic questions you have based on the programs we’re in. Come on as many tours as you like and ask all the questions you have! Even if you’re not sure of what to ask on a tour, listening to the tour guide’s information and responses to other people’s questions can be immensely helpful. Tips Tuesdays – Episode 6: Visit U of G on your March Break! March Break is coming up quickly and we’re giving you a BIG tip on how to spend your holidays – visiting the U of G and exploring campus on a March Break Tour! Meet the people, eat the food, checkout the residences, visit some lecture halls and witness what U of G means to its students – we know you won’t be let down. It’s here. It’s live. It’s ready for you to sweat in it… okay maybe save the sweat for September but the Athletic Centre is yours to explore on our March Break Tours. Don’t be afraid to ask questions on the tour to learn more about membership prices, what’s covered in your tuition, fitness classes and more. Because there are quite a few of you who will be coming to campus on March Break, we’ve brought on extra tour guides. More tour guides = smaller groups and more interaction. You’ll have more one-on-one time with your guide, and have lots of time to get your questions answered. Stick around after your tour, grab some lunch at an on-campus eatery and picture yourself here! Tip #5: Take it all in! As with our regular tours, you’ll visit residence, lecture halls, the library, the University Centre, and other academic areas. You’ll also interact with our passionate tour guides who are here to share their experiences and tell you a bit about what to expect in your years at U of G.
What are you waiting for Future Gryphons? Take the first step in making U of G part of your 2018 and register for a March Break Tour. See you soon! Coolest thing about my program is that in the winter of your third-year, you can spend one semester at Seneca College, taking lab focused courses in their laboratory technician program. It also offers co-op, which is awesome! I just really love the vibe of this campus and wanted to share that with incoming students. The goal of this year is to influence at least one person to come to U of G.
I love giving incoming students/athletes tours because I work in the athletics department, and I try to stay as involved with athletics as possible. I also love parents who try really hard to embarrass their kids while on the tour because it reminds me of when I did my campus tour with my own parents. Super nerdy, but there’s this one room in the Summerlee Science Complex that has a couple NMR’s in it (cool chemistry instruments) and it was really exciting when I was trained on them; so I hold that close to my heart. Or, the student lounge in the Athletic Centre! Students should come for a tour because you absolutely cannot understand the vibe and energy of U of G just from online. We have a campus that’s really special to be on and I find students always see that when they come for a tour! Look at every school because you are going to have to live in that city/attend that school for the next four years and it’s important to find somewhere that really fits. Also, don’t be shy to ask questions on your tour! Good luck Future Gryphons! We believe there is no single way to learn and not everything can be taught in a classroom. This is why U of G offers MANY experiential learning opportunities for you to apply your classroom knowledge, network within your industry, and be prepared to work in your field after graduation. Today we’re breaking down the many experiential learning prospects offered here at U of G.
Not only are co-ops a great way to gain work experience, they also introduce you to others in your industry and allow you to build your professional network. Not sure if an industry is right for you? Completing a co-op placement can be a great way to see if you can picture yourself working in that field after graduation. If you try something that isn’t right for you, choose to do your next placement somewhere that may be a better fit. At U of G, each co-op student will have exceptional support from co-op coordinators, advisors, peer helper students and a student advisory committee! Did you know that you have the option to study almost anywhere in the world WHILE gaining credits to your degree? We believe the entire planet is your classroom, so if you’ve always wanted to see the world, take advantage of these opportunities Future Gryphons! Some of our programs require students to complete an internship, practicum or placement – more great ways to gain industry experience and apply what you are learning in class to the real world. This is where you put classroom theories into practice; often in a natural setting. These courses typically involve collecting data using methods learned in class. In the Engineering and Computing programs, students have the chance to complete design projects where classroom lessons are put to the test. Engineering at U of G is very design based, meaning many of the courses offered involve designing a solution to a problem. Computing students will get the chance to compete in a 24 hour Hackathon where they are challenged to develop software solutions to contribute to a global issue. Both programs give students the opportunity to work individually and collaboratively and engage in some friendly competition – sometimes with prizes up for grabs! These are typically completed during your final year. Most capstone courses involve long-term projects encouraging critical thinking and problem solving. These projects are meant to help you apply what you’ve learned throughout your degree and develop important skills like communication, planning and teamwork. The skills you learn in a capstone course will help you succeed in the workplace, in grad school and life in general. Think of these courses as the cherry on top of your degree – not mandatory, but they make your experience a little sweeter. At the U of G, we view experiential learning as anything that enriches your undergraduate education. This includes anything from volunteering to work-study jobs to continuing your education through grad studies. 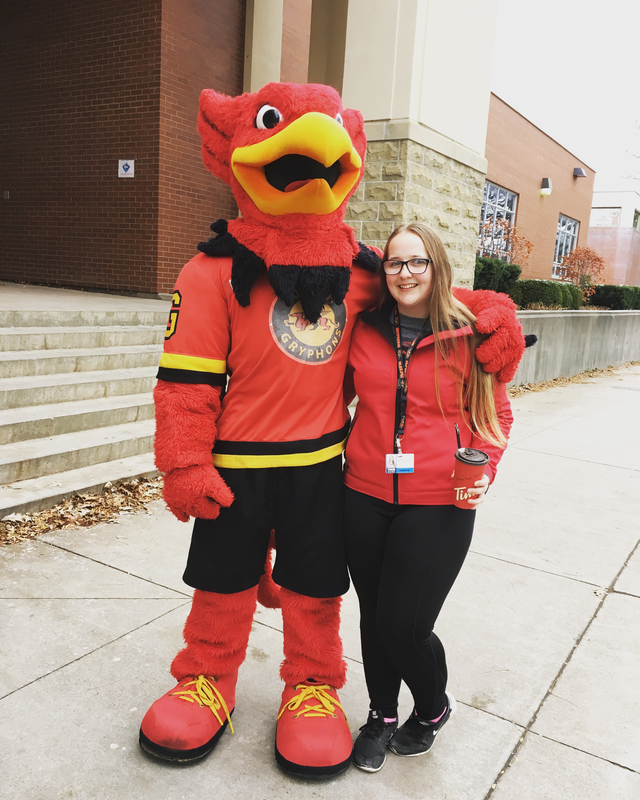 At the University of Guelph, we know that even the most well-rounded students sometimes need a little support, whether that be academically, physically, mentally, or emotionally. We’ve got a service to meet each of these needs, and some services you may not even know you need! Check out their list of programs to see all that Student Life offers students. In addition to these on-campus services, U of G also houses 250+ clubs and organizations! These span cultural and religious interests, media and arts, sports and academics, community services and student governments. There are so many ways to get involved, and we’re here to support you throughout your university journey Future Gryphons! The application deadline for undergraduate students is March 1st, 2018. That’s next week! U of G students are happy here. We’ve been ranked as one of the top universities for student satisfaction. We offer you amazing scholarship opportunities. Last year, we gave out $20.5 million in merit- and needs-based awards. U of G offers you various experiential learning opportunities, including: co-op, extra-curriculars, study abroad programs, independent research, placements, field courses and more. We have been one of Canada’s top comprehensive research universities for 15 years. We think that’s pretty IMPORTANT! 91.4% of our grads are employed within 6 months of graduation. We have an impact! Apply to the University of Guelph today via OUAC. The deadline for high school students to submit the Background Information Form is March 1st, 2018. Once you complete the form, you must submit it as an attachment to bla-bif@uoguelph.ca, with the subject line: lastname_firstname_BLABIF. Note: The deadline for Transfer students isn’t until May 1, 2018. Your admission decisions will be made in early June. Happy Friday Future Gryphons! Today we’re answering the most frequently asked questions about our DVM program. Q: What courses should I take in high school? A: You should take courses that will prepare and admit you to the degree program of your choice. You will need to complete 8 required courses while in this program. Visit the Ontario Veterinary College website for more information on admission requirements. Q: Do you have a better chance of getting into OVC if you do your undergrad at the U of G? A: Before applying to DVM, you can study at any accredited university or degree program at an accredited College as long as you complete the 8 prerequisite courses and meet the additional admission requirements. Q: Do you need to take Animal Biology or an Animal related major to be eligible to apply to DVM? A: There is no specific program or major required to apply to DVM. It’s all about getting those prerequisites and admission requirements! Choose a major that allows you to take all of the prerequisites, and you’ll be just fine. Q: What is the minimum amount of animal/clinical experience needed to apply to DVM? A: Experience is about QUALITY not QUANTITY. There is no specific number of hours of animal/clinical experience required to be considered for admission. Just make sure your experience gives you solid exposure to the veterinary field, that you develop strong connections and that you feel confident working in the field. Quality experience = working with different species, under a vet supervisor, in a lab or government setting. Q: I’ve had pets all my life, does this count as animal experience? A: Pet ownership does not count for experience – sorry! We know, we love our pets, too. Q: Are grades or experience more important for your admission decisions? A: BOTH grades and the experience/references listed on your Background Information Form (BIF) are used to determine your eligibility. Your experience will help you nail that interview, which is 35% of your ranking, and your academic performance will determine the other 65%! Check out the Future Students section of the Ontario Veterinary College website for a better breakdown on the admission process. Q: Is the MCAT required to apply to DVM at U of G? A: The MCAT is not required for applicants. Q: When can I apply to DVM? A: You can apply after you’ve completed 2 years of your undergrad. Students typically apply in their 3rd year of undergrad. You may choose to complete your full degree or even go on to do a Master’s degree before applying, but this is not required. Q: How competitive is it to get in? A: Competitive? Yes. Impossible? NO! Q: What specializations can I pursue? A: The DVM program prepares you to work with a diverse range of animals (including exotics!). You will decide which “stream” you want to pursue in your third year of the DVM program. Stream options include Small Animal, Large Animal, Food Animals and more! Q: What are my options after I graduate? Q: Are there any clubs or student organizations related to the DVM program? A: There sure are! Check out the ‘Future Vets Club’ when you get to Guelph! They support and guide undergraduate students intending to apply to vet school by hosting information sessions, helping students find volunteer placements and providing a glimpse into the veterinary profession. Checkout their Facebook page now, #futuregryphons! Q: Are there places in Guelph that students can volunteer at? A: There are many opportunities to volunteer at the OVC and in the Guelph area during your undergrad and even before you start university! Check out the OVC website for information on current volunteer positions. A: In total, 4 applications for admission to the DVM program will be considered from an individual. This includes applications in either the undergraduate cohort or the graduate cohort. Q: When will I find out if I got an interview? A: The OVC admissions committee will review the top applicants to verify that they are suitable for interviews. Candidates who are invited for an interview will typically receive an email the last week of April. Q: When will I find out my interview score? A: All interviewed candidates will be sent their interview score in June. This score is an average score across the 8 stations scored out of 100. Visit the Ontario Veterinary College website for more frequently asked questions and more information on the DVM program. 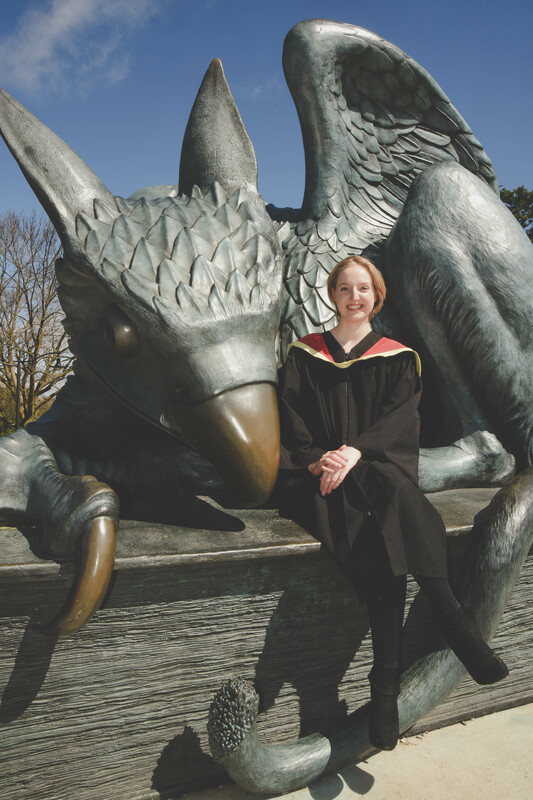 Attention Future Gryphons: This Thursday, February 15, 2018 is the deadline for students studying outside of Canada to submit an application to the University of Guelph. Visit the Admission Services website for details on how to apply and check our calendar for additional information on upcoming deadlines.